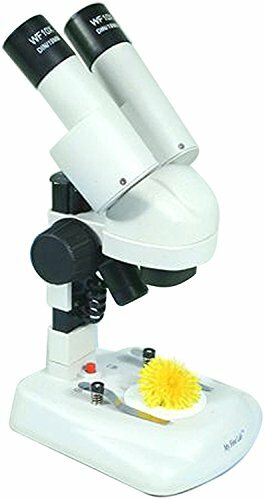 Finding the best children’s microscope can be difficult. There are so many different options available that it can become confusing trying to find one that you know your child will love. Well, that’s why we’ve taken care of the hard part and researched what the top options bring to the table. All you need to do is read through the review below and find the ones that stick out to you the most. A buying guide section is also available at the end to provide you with further details. 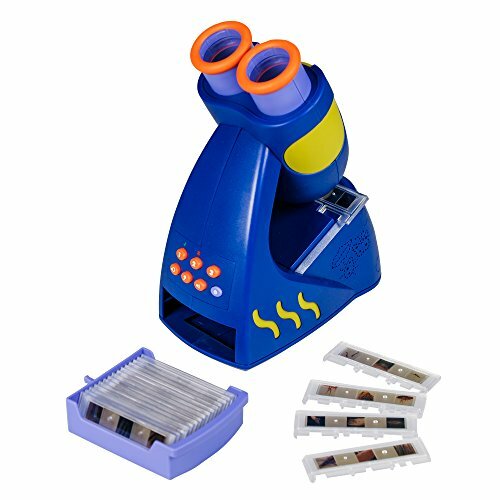 The JuniorScope Microscope for Kids comes with a total of 3 magnification levels. These include 40x, 100x, and 400x. As a result, kids are able to zoom in with a lot of clarity. The glass optics that are available with this one are also of a high standard. Therefore, kids are able to see with precision. This also makes the microscope safer for kids to use. We liked how this is a beginners microscope as allows children to observe germs, DNA, insects, plants, and more by using the focus knobs. These can be easily adjusted so that kids are able to get the whole experience. This set comes with forceps, a petri dish, stains, a test tube, slider, dropper, cleaning paper, and more. It’s also powered by a battery which makes it easily portable. We liked how there are even LED lights available for complete visual clarity. 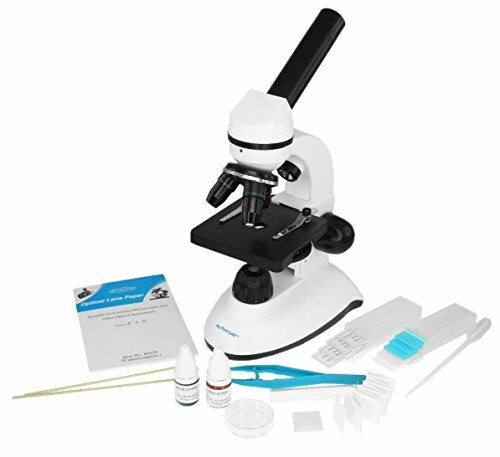 This is an excellent microscope set for beginners that enables them to observe various things with a lot of clarity. The Gosky Microscope Kit for Kids and Beginners is a fantastic way to introduce your kids to observing science. This kit comes with magnification levels of 300x, 600x, and 1200x. As a result, children are able to observe tiny organisms with a lot of detail. There is a total of 72 pieces available with this, which makes it a very complete set for kids. A storage case is also available to keep all of the pieces in one place. This also makes it easy to carry the kit around with you. We were impressed with how there’s even a smartphone adapter available. This allows kids to take pictures of the tiny organisms that aren’t visible to the human eye. They can then share the pictures and study them further with others. The metal construction of the frame with this one also ensures that it’s durable and will last your child for years. This is an awesome kit that comes with a smartphone adapter that enables kids to take pictures of what they’re observing to share it with others. 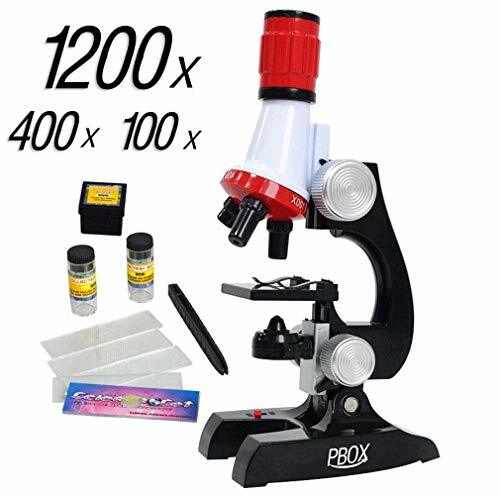 This AmScope Student Microscope features magnification levels between 40x and 1000x. Therefore, kids are provided with plenty of magnification power to observe small organisms that can’t be seen by the naked eye. There’s a single lens condenser that features a disc diaphragm that comes with 6 holes. In addition to this, there are LED lights available on the top and bottom. These are effective at providing kids with a clear vision while looking through the microscope. We also liked how they’ve used a high-quality metal material to construct the frame. This provides you with the reassurance that it’s durable and will last your child for years to come. There is also a variety of accessory items available that can come in handy. The magnification levels and LED lights that come with this set make it ideal for children to clearly see the small organisms that they’re observing. This Science Kits for Kids is an excellent beginner set that introduces kids to new tools in a fresh and exciting way. It encourages children to want to learn more about science. There are 3 magnification levels available, which include 100x, 400x, and 1000x. Therefore, kids are able to see small organisms with a lot of detail. This is especially the case due to the LED lights that are available. These ensure that kids are able to observe things in the best light possible. Due to the wide range of accessory items that are available, you can be sure that your child will be entertained with this set for a while. This is also great for helping them to learn more about how different tools work. Kids have a blast using this set to learn more about science and how to observe various organisms. The My First Lab Duo-Scope Microscope works as a stereo and compound microscope, which gives it an awesome 2-in-1 feature. Therefore, kids are able to use it to observe things on the slides, as well as other items, such as small rocks. There is a total of 50 pieces available with this one, which includes a range of slides, a dropper, cover glass, slide labels, forceps, test tubes, petri dishes, lens paper, and more. Therefore, you can be sure that your kids are provided with everything they need to learn more about science for hours on end. The magnification levels that are available range from 40x to 400x, which is enough for kids to be able to observe things properly. We also liked how they’ve included an instructional manual. It helps kids to figure out how to use all of the accessories, which is a great learning experience. 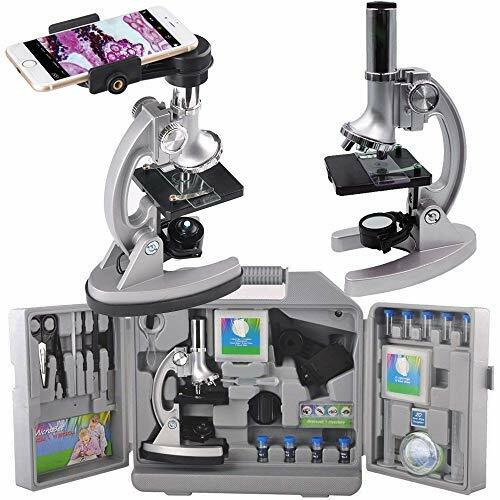 This is an awesome set that enables people to look at both 3D objects, such as rocks, as well as smaller organisms, on the microscope slides for kids. This My first Lab i-Explore STEM Stereio Microscope kit enables kids to look at 3D objects, such as rocks, bugs, or leafs. We liked how they’ve used real glass optics with this one as it lets children observe things with a lot of clarity. This is also helped as a result of the 20x magnification that’s available. They’ve also implemented an LED light which lets kids clearly see what they’re observing. A binocular head is also available which allows kids to view things comfortably through both of their eyes. A field microscope is available which has a lightweight design and is super fun for kids to use outdoors. This is an awesome way to encourage your kids to be outdoors and explore more often. The deluxe hand bag that’s available ensures that you’re able to keep the microscope clean and safe, wherever you take it. We liked how this one encourages children to be outdoors and explore nature more. They’re able to learn about various insects and other 3D items while using this kit. The Educational Insights GeoSafari Jr. Talking Microscope comes with the voice of the famous Bindi Irwin, which kids have been loving. It also comes with a total of 60 slide images which kids can use to observe a wide range of things. In addition to this, we were impressed to discover that they’re also included 100 questions and facts about plants and animals. This is highly educational for kids and helps them to learn, while also having fun. The double eyepiece that’s available makes it a lot easier for kids to observe things with both of their eyes open. A slide storage has been built-in to the toy microscope, which makes it incredibly easy to clean up all of the parts. 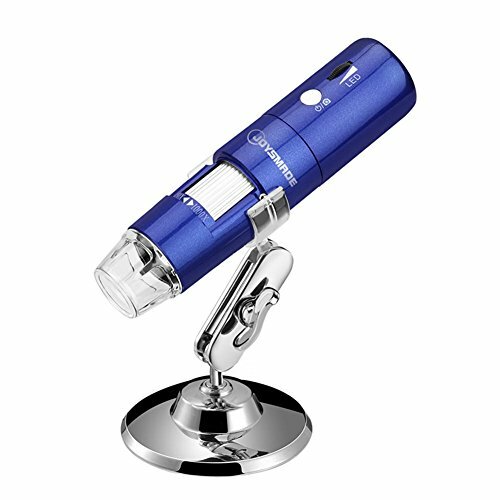 The Jiusion WiFi USB Digital Handheld Microscope allows kids to observe all kinds of things, from insects to coins. It comes with LED lights built-in which make it very easy for children to clearly observe what they’re looking at. There are also 2 knobs available that can be adjusted to change the brightness and focus. We liked how this microscope it compatible with a range of different devices as it allows kids to record things and take pictures to upload. As a result, they’re able to continue to observe and learn more. There is also a carrying case included which makes it easy to store all of the pieces that are available. This also makes it a lot easier to carry the set around with you while you’re on the move. We liked how this microscope can connect to various devices for kids to take videos and pictures of what they’re observing. They can then go back to it later on to continue to learn more. 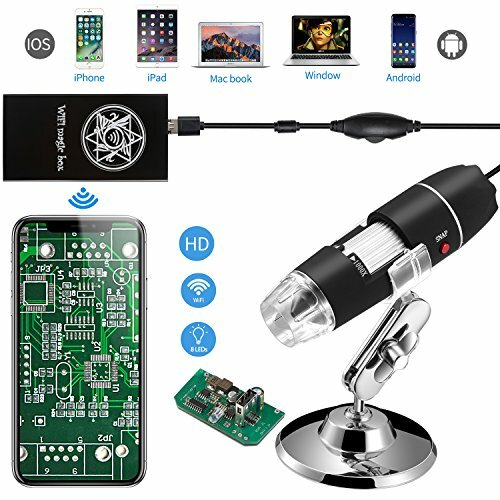 This JOYSMADE Wireless Wifi USB Digital Microscope can be connected to smartphones via a wifi connection. Therefore, it’s compatible with devices without wires which is very easy to use. Kids can use this feature to take pictures and videos to observe what they’re looking at later on. We liked how this is a small microscope as it enables kids to carry it around with them to observe things with ease. When it has been fully charged, it can function continuously for 3 hours. Furthermore, this mini USB microscope comes with a maximum magnification level of up to 1000x, which is pretty impressive! Therefore, kids are able to observe things with a lot of detail. 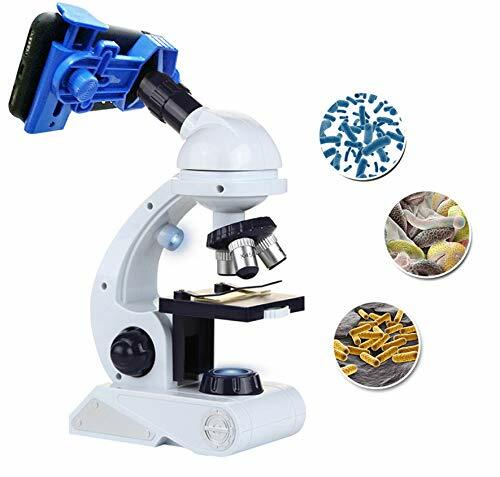 This is an excellent mini microscope that kids can easily travel with and carry around to observe plants, insects, and anything else they find outdoors. 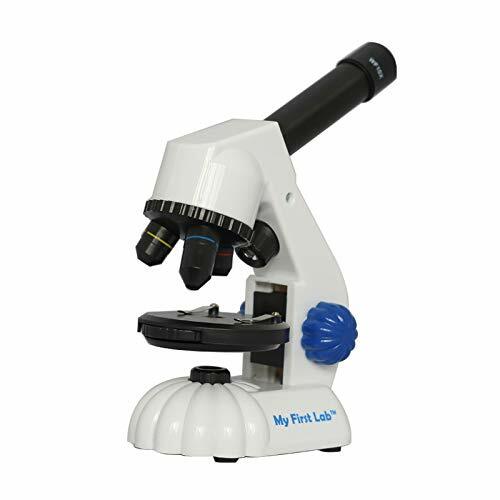 This My First Lab Mini-Duo Scope is a fantastic beginner set for kids that comes with a dual LED illumination feature. This enables kids to see what they’re observing with clarity. We also liked how children can look at flat organisms by using the glass slide that’s available, as well as 3D items. The flat items are lit from below and the 3D ones are lit from the top, which makes it very easy to see all of the finer details. 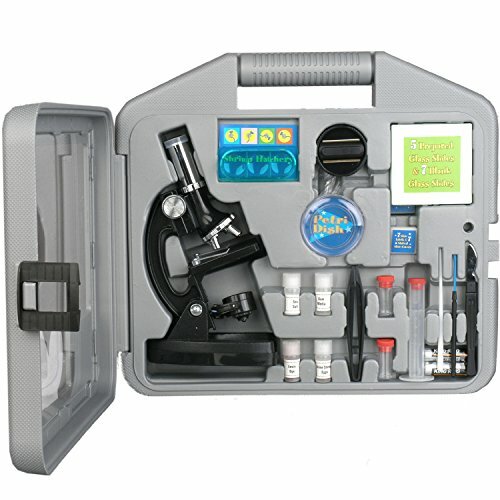 There is a total of 20 accessories available with this kit which means kids are provided with everything they need to start learning more about science. They’ve included lenses that are coated to ensure that they remain clear for longer. This is also effective at preventing the lens from growing mold over time. With 20 accessories, LED lights, and the ability to observe flat and 3D specimens, kids have everything they need to have fun and start learning about science. The AmScope-KIDS Kit features a total of 6 magnification levels that range from 120x to 1200x. Therefore, kids are provided with plenty of magnification power to observe tiny organisms in a lot of detail. There’s a reflecting mirror available which creates the effect of natural illumination when looking at things during daylight. For the times when it’s darker, there’s a built-in light to ensure children are able to clearly see through the lenses. We liked how they’ve used high-quality metal materials to construct this microscope as it provides it with a lot of durability. Therefore, you can feel confident in knowing that your kids can use it for years to come. The 6 magnification levels and built-in lights ensure that kids are able to observe organisms with complete clarity. This Kit has been made using high-quality ABS acrylic materials, which works to keep it durable. There are LED lights built-in which ensure that kids are able to observe things in the best light. There are 3 levels of magnification available, which include 80x, 200x, and 450x. This is great for kids who are using this kit as a beginner as they’re able observe things in a lot of detail. This set comes with a wide range of accessory items. These include 9 slides, a microscope, needle, spatula, collecting bottles, tweezers, a scalpel, and a plastic container. Therefore, kids are provided with everything they need to begin learning about science at a young age while having fun at the same time. 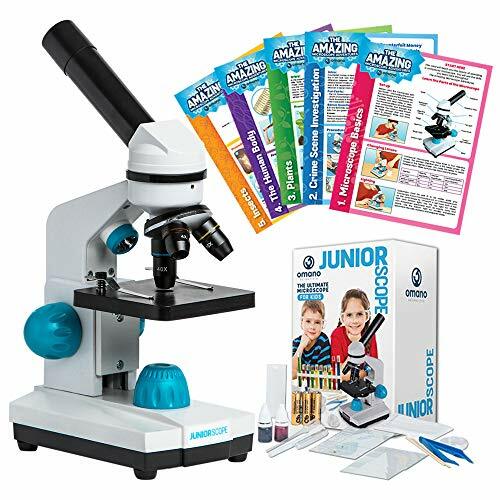 Kids have a blast using this kit to learn more about science due to the 3 magnification levels, LED lights, and range of helpful accessories that are included. Now that you have a better idea of what some of the best children’s microscopes have to offer, you can begin narrowing down your search to finding the one that you think they’d love the most. If you still aren’t feeling completely confident on your choice, you’ll want to take a look at this buying guide section below. We’ve put together some additional information surrounding the different kinds of kits, brands, and benefits to help you out. 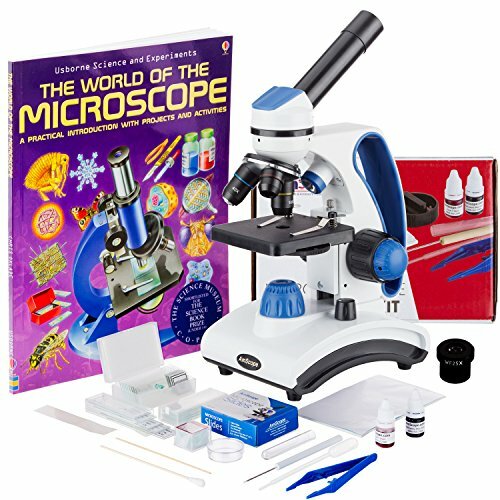 After reading through our review, you will have seen that there is a range of different microscopes available for kids. If you were interested to learn more about what makes them different from one another, have a read of the section below. The kits and sets are the ones that come with a range of accessories. Therefore, if you were after something that keeps kids engaged for hours on end of fun and learning, we recommend going for the kits and sets. They provide kids with all of the relevant parts that they need to learn more about science, without having to wait on further deliveries for additional parts. The talking microscopes are a highly entertaining way for children to learn more about science. This is because the talking feature is highly interactive and makes it more exciting for kids to use. These may be better for younger kids who may need something additional to keep them engaged in the microscope to continue learning. The binocular types of microscopes are a great option if you were looking for something that your kids can use to observe things with both of their eyes. With the regular monocular microscopes, children are only able to use one eye to observe the specimens and their other eye has to be closed. So, if they were going to be looking at things for a longer period of time, binocular microscopes may be best as they’re more comfortable. The USB microscopes are mini versions which means kids are able to carry them around with ease and pull them out to observe things in nature. We liked how they can easily be connected to various devices, such as smartphones and computers. They enable kids to take pictures and videos of what they’re observing, which lets them learn more about it at a later stage. There are a few popular brands that manufacture microscopes for kids that we’ve mentioned in this review. To learn a little more about them, this is the section for you. Discovery Kids are a popular brand that has been manufacturing high-quality toys for kids for more than 40 years. They make toys for newborns that are effective at helping babies to develop properly. In addition to this, they make a wide range of toys for kids as they grow older, which help them to learn more and be creative, while also having fun. Educational Insights is another awesome brand that encourage children to play with a lot of imagination to ensure that they’re having fun. However, they always make sure that their toys have the underlying goal of being educational. Kidcia are a fantastic company that love to create toys for kids that enable them to learn more, while also having a blast. As a result, their toy range is effective at encouraging children to continuously want to educate themselves as they grow older. There are a number of benefits that the youth can experience while using the microscopes mentioned in this review. To learn more about what these benefits are, take a look below. One of the most notable benefits to getting your child a microscope is that it help to teach them more about science with a first-hand approach. This is a lot more fun for kids and it encourages them to want to continue to learn more about science because of how much fun the process is. Children are also given the opportunity to learn more about different plants and insects. This is awesome for expanding their knowledge on things that they might not have even known they were interested in! Even if you have a larger set that can’t be easily carried around outdoors, kids are able to go out and find things to bring back and observe. When it comes to the mini microscopes, kids can have a blast being out in nature and exploring all it has to offer. They’re able to take pictures and videos of what they’ve observed to learn more about the specimens later on too. So, that concludes our review on the best microscopes for kids. All of the information that you need to go ahead and pick a microscope from the choices above can be found right here. Be sure to read through all of the main features, pros, cons, age recommendations, and what makes each one stand out. That’s what will leave you with the best idea of whether or not your child would enjoy using it. The buying guide section above also provides you with additional details. Hopefully, everything you need to feel confident about your final decision can be found in this post!